(Princeton, 2017) xii + 317pp. Reviewed by Christopher Donaldson on 2018-06-06. Ten years ago, Maureen McLane suggested that scholars might pay more attention to "the media situation of Romantic poetry" (Balladeering, Minstrelsy, and the Making of British Romantic Poetry, 2008, p. 234). Since that time, studies such as Julia Carlson's Romantic Marks and Measures (2016) have confirmed the value of attending to what McLane called the "trans- and inter-medial" contexts (243) in which the works of Romantic writers were created, circulated, and consumed. Tom Mole's new book makes an innovative contribution to this developing body of research. Combining examinations of literary history, print history, and bibliography with considerations of media archaeology and material culture, Mole's book furthers our understanding of the reception and canonization of five writers now commonly regarded as Romantics: Lord Byron, Felicia Hemans, William Wordsworth, Percy Bysshe Shelley, and Sir Walter Scott. As the title of Mole's book makes clear, he is less interested in the works of these writers per se than in the Victorian contexts in which new ideas about their legacies and their literary period began to cohere. More specifically, he aims to look beyond the high culture of authors, critics, and litterateurs to explore the popular contexts and multiple media through which Romantic writers and their works reached Victorian audiences. Accordingly, rather than investigating only the literary and critical discourses conventionally associated with reception history, Mole sets out to examine other, less widely acknowledged ways in which the works and reputations of Romantic writers were remade for and by their Victorian posterity. From snuffboxes to sermons and from public memorials to marble busts, Mole's book surveys a motley assemblage of artefacts and practices that collectively enhanced and consolidated Victorian conceptions of the Romantic period. More than just presenting a reception history, then, Mole's book advocates a more liberal and holistic approach to the study of literary reception itself. In this sense, Mole aims to show how the forces of canonization and commodification, although "sometimes rhetorically opposed" (20), worked in tandem to shape the cultural afterlives of Romantic writers and to define the era in which they lived. 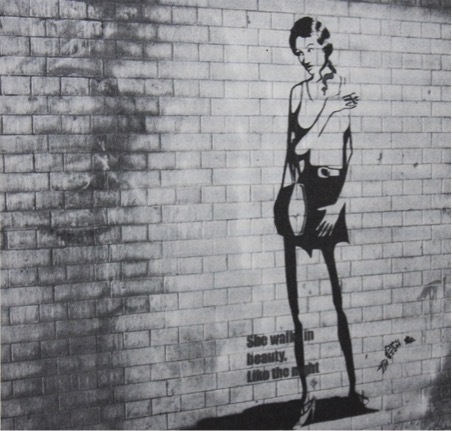 Instead of merely tracing webs of intertextuality or constructing genealogies of literary influence, Mole contends, reception histories should also consider the broader "media ecology" in which the works of Romantic writers participated and were, through their participation, transformed. Mole thus presents a model of reception that is confined neither to a single discourse or medium, nor to the context and period in which a literary work was first created or published. Instead, he claims, we should "recognize reception history as a process mediated by the creation of new material artifacts, incorporating different media and reflecting the efforts of several individuals divided by time and space" (54). Viewed in this way, literary reception is not a matter of passive inheritance. It is rather a process of negotiation, mediation, and renovation through which the literature of the past is remade to suit the needs and concerns of the present. To examine such a process, one must carefully evaluate the terms by which a given epoch constructs and enacts its relationship with its precursors. Accordingly, the first section of Mole's book (Chapters 1 to 3) explores the "media ecology" of the Victorian era to show how new practices and modes of production generated an incipient sense of modernity: a modernity that first threatened but eventually enshrined the works and reputations of writers from the previous generation. In this first section, which provides an extended introduction to the book, Mole seeks both to contextualize the Victorian delineation of the Romantic period and to clarify the rationale underlying his approach. He eschews the limited scope of what he calls "punctual historicism": scholarship that privileges the original context of literary works to the exclusion of the other, later contexts in which those works were encountered or transmitted. While punctual historicism often illuminates works of literature, Mole notes, it gives "the impression that literary works are events that happen once only" and thus fails to recognize how those works "function in later contexts for other readers" (23). Mole stresses these later contexts. Taking his cue from Alasdair MacIntyre, he urges us "to think of literary texts as repeatedly reactivated by later readers -- and even non-readers -- in contexts and media beyond the imagination of their authors" (23). In each of the four subsequent sections of the book, Mole develops this point by highlighting specific instances of such "reactivation" with respect to distinctive cultural processes, products, and practices. The second section (Chapters 4 to 6) considers how Victorian publishing culture manifests the generational divides documented in the first section. Mole's prime example is what he dubs "retrofitted illustration": the practice of using new illustrations -- including engravings and photographs -- in Victorian editions of the works of Romantic writers. Such illustrations, Mole argues, served specific commercial and taste-making purposes: they enabled publishers not only "to promote the sale" of new versions of old works, but also to "renew interest" in writers who were in danger of "going out of fashion" (51). 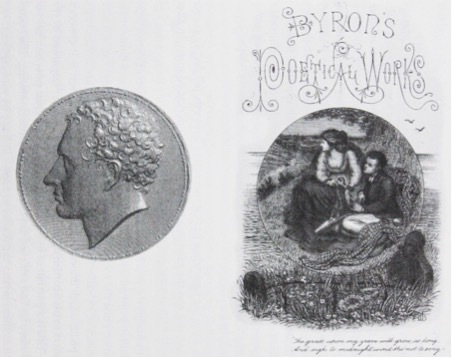 This "potential for renewal," Mole shows, helped to shape the fortunes of select editions of the works of Byron, Wordsworth, and Hemans, all of which featured illustrations drawn from Victorian modernity instead of the Romantic past (55). These new editions also appealed to Victorian readers by using illustrated frontispieces to evoke the poet's personal past. As Mole explains, the frontispieces in Victorian editions of the poems of Byron, Wordsworth, and Hemans often paired "idealized memorial images" of the poet with depictions of his or her early life (see below), which invited Victorian readers "to turn back time, and to experience poetry from the past as though it were fresh and new" (72, 75). In this way, Mole concludes, illustrated editions "offered new ways to connect" the works of Romantic writers "to the current generation of Victorian readers" at "the moment when the Romantic generation seemed about to slip into the twilight of history" (85). From here, the third section of Mole's book (Chapters 7 to 9) turns to examine religious speech and writing as a context for the Victorian reception of Romantic literature. Extending the work of scholars such as Stephen Gill, Mole identifies religious discourse as crucial to "the web of reception that remade Romantic writing for Victorian audiences" (99). More than previous scholars, however, Mole reveals how the works of "apparently irreligious poets such as Byron and Shelley" were adapted and reformed to suit the agendas of liberal and conservative Christian communities alike (4). Accordingly, Mole uncovers the "informal campaign" that "a number of clergy and laypeople conducted" to "encourage" their fellow Christians to recognize the "religious truths revealed" in Shelley's "infidel" verse (100). Likewise, we are shown how the prominent Baptist preacher Charles H. Spurgeon used choice excerpts from Byron's poetry to stock his "homiletic arsenal" and to warn his congregations about the "wages of sin" (121, 122). Reconstructing the religious import of Romantic poetry may seem at first different from retrofitting new illustrations to it. Ultimately, though, both modes of literary transmission are demonstarted to have played an important part in marketing the works of Romantic writers to "audiences across the social spectrum" (130). As Mole surmises, the sermons of preachers such as Spurgeon must have reached multitudes. Consequently, as Mole observes, the "religious reception tradition" helped to establish a conception of Romantic literature encountered both by the literate and illiterate, and by readers and non-readers alike (130). Readers and non-readers were also reached by the artifacts Mole investigates in the fourth section of his book (Chapters 10 to 12): literary monuments and statuary. 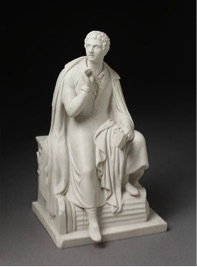 To show how commemorative statues of canonical Romantic writers shaped the memorial geography of Victorian Britain, Mole considers how the images and legacies of Byron and Scott were sculpturally "conscripted into the construction of a national consensus" during a period defined by reform, upheaval, and innovation (136). For instance, Mole unpacks the series of events that saw Bertel Thorvaldsen's statue of Byron (below left) installed not in Westminster Abbey but in the library of Trinity College, Cambridge. Mole also explains how the Scott Monument (below middle) came to be dedicated in Edinburgh and how Richard Belt's statue of Byron (below right) came to be erected in Hyde Park. In all of these different media, the monumental portrayal of Byron and Scott helped to promote the two bestselling writers of the Romantic period as members of an evolving national pantheon and as exemplars of the nation's "shared past" (133). As Mole makes clear, though, this process of cultural canonization also entailed editorial mediations and "acts of selective forgetting" (135) that were comparable to Spurgeon's homiletic reworkings of Byron. In short, like Spurgeon's sermons, the literary monuments Mole considers are shown to have deliberately "marginalize[d] some parts" of the works of writers such as Scott and Byron in "order to render them suitable for the admiration of wider audiences and later generations" (135). The act of editorial intervention is a recurrent focus of Mole's study, and it links his examination of statues, sermons, and illustrations with the mode of reception scrutinized in his final section: literary anthologies. Literary anthologies, as Mole explains, were particularly influential as they were "widely read, even -- perhaps especially -- among those who had access to very few books" (185). Consequently, the versions of Romantic poems thus anthologized can be seen to have determined what countless Victorian readers (and presumably listeners) thought about the literature of the Romantic period. In particular, Mole aims to show how the editors of Victorian anthologies adapted the long and short poems of Hemans, Byron, and Shelley to suit the format and focus of their collections and to shape the reputations of these Romantic writers and their works (187). Building on the work of scholars such as Ian Michael, Mole surveys what editors did with the poems of Hemans, Byron, and Shelley in a selection of 210 anthologies published in Britain between 1822 and 1900. The findings of this analysis shed new light on how the editors of Victorian anthologies helped to promote "previously marginalized poems" (195) and, equally, how these editors "decontextualize[d] the gobbets they excerpted" from longer poems in order to minimize potentially radical "political content" and "objectionable material" (211). In sum, Mole shows, Victorian anthologies selectively commemorated Romantic writers in a manner comparable to the way literary monuments did. As "mediators in" a wider "web of reception," these anthologies enforced a deliberately partial reading of Romantic poets and poetry to a wide audience and, in doing so, helped to establish a conception of Britain's modern literary canon (211). Mole clearly prefers the second of these two remediations. But in his analysis, both of them are revealed to demonstrate how many of the patterns of Romantic reception established in the Victorian era continue to play out in the present day. Altogether, Mole's book investigates the diverse ways in which Victorian audiences responded to the literary culture of the Romantic period. The resulting study enriches and enhances our collective understanding not only of the cultural history of British Romanticism, but also of the processes of reception and remediation through which literary periods are formed. Mole's argument and approach, however, occasionally raise questions that one would have liked him to pursue more rigorously. At times, for instance, the conception of Romanticism he ascribes to Victorian audiences seems anachronistically complete and coherent. At other points, Mole's treatment of commentators such as Matthew Arnold and Henry James as part of a single cultural continuum risks flattening and oversimplifying the Victorian era. In addition, in restricting himself almost entirely to the reception of poetry, Mole ends up neglecting other genres, including the novel, which contributed to the Victorian canonization of the Romantics. Given his preference for poetry, moreover, it seems surprising that Mole should stop short of giving more serious consideration to the reception of the works of writers such as William Blake. 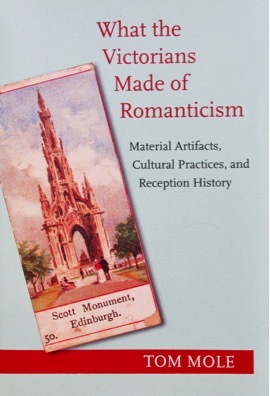 Nevertheless, What the Victorians Made of the Romantics makes an outstanding contribution to the inter-medial study of literary creation and consumption. It is a book that will profitably engage scholars of both reception history and nineteenth-century literature and culture. Leave a comment on Christopher Donaldson's review.